Recently two audio clips (see below) of Sharma’s broadcast have emerged. They were recorded in 1984 by Sven Grahn in Sweden. The audio clips are part of a TV broadcast transmitted on 7th April and captured over two orbits. The first clip Sharma talks about the Yoga experiments and in the second, we hear him for the first time speaking in Russian about the pictures of Indian leaders he took with him to space. He mentions the defence minister because Rakesh Sharma was a member of the Indian Airforce and had no connections with ISRO. The audio was originally recorded live by Sven Grahn and transcribed from Russian to English by Bart Hendrikx. Transcription and the audio clips below. My thanks to them both. In 1984, Wing Commander Rakesh Sharma became the first Indian national and the 138th person to enter space. His trip into space was part of the USSR’s Interkosmos programme. During this programme, 14 non-Soviet cosmonauts travelled to the USSR’s Soyuz space station in low earth orbit stations between 1978 and 1988. On Tuesday, 3 April 1984, at 10:38, Rakesh Sharma with Commander Yuri Malyshev and Gennady Strekalov blasted off from the Baikonur Cosmodrome the Soyuz T-11 spacecraft. Ten minutes later, Soyuz T-11 was in a 224 kilometre LEO on its way to dock with the space station Salyut 7. After just over a week on Wednesday 11th April Sharma returned to Earth aboard Soyuz T-10 as planned to the USSR 46 km to the east of the city of Arkalyk. During his 8 days, Sharma conducted several observations, experiments and participated in live TV broadcasts. His first broadcast and conversation with the Indian prime minister Indira Gandhi took place on the 4th April and is well documented. 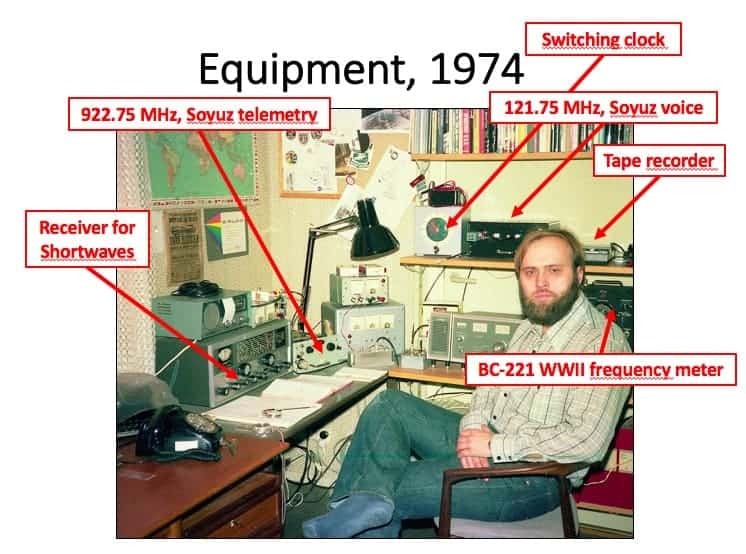 Sven Grahn and his equipment in 1974. Credit Sven Grahn. In order to conserve muscle tone as well as (inaudible). As everyone know this is due to the lack of gravity and tends to expand a bit. So for these exercises we have selected 5 (in audible) and other warming up exercises padma asana, and again we will go back and get some more readings which will then be compared before flight and after flight and then we will know. And no I have not done yoga before coming [to this] programme but that again makes me a better subject because there is no preconditioning involved. When I reached here it was without the help of yoga and I did yoga only here and therefore the results will be more interpretable. We have brought with us to the station pennants and flags of the Soviet Union and India, coats of arms, commemorative medals, envelopes. We are now showing you pennants made on the occasion of the joint Soviet-Indian spaceflight, diplomas. Right next to us is a medal of Gagarin made on the occasion of the 50th birth anniversary of Gagarin and awarded to the crew of the Salyut-7/Soyuz orbital complex, cosmonauts Kizim, Solovyov and Atkov. We have also brought with us symbolic items from India about which Rakesh Sharma will tell you more. Sven Grahn has been working in the space field in one way or another for over fifty years. 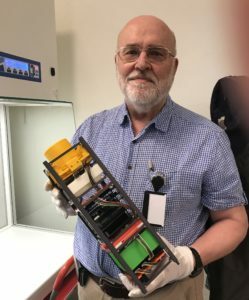 Officially retired, he continues to work as a project leader of a student satellite at the Royal Institute of Technology in Stockholm. He is perhaps best known for his work in tracking satellites launched by the secretive Soviet Union during the 1960s and 1970s.In those pre-internet days, his work along with others helped to identify individual mission characteristics such as mission types, members of the crew, take off and landing times. He recorded over 1000 conversations from orbiting spacecraft as they flew over Sweden. Satellite tracking. What he tracked, heard and recorded using radio and tape recorders. As an 11-year-old, Sven had seen Sputnik in the sky over Sweden with his own eyes. I started by asking him how the onset of the space race had impacted his choice of career? With a population of 1.2 billion people, India has just one national with first hand experience of spaceflight. 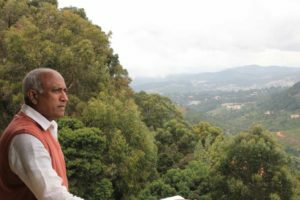 Rakesh Sharma, a now retired Indian Air Force wing commander in 1984 spent eight days in space aboard the Soviet space station Salyut 7. This account of his spaceflight was recorded at this home in the Nilgris region of India in August 2013.